With all this talk about new technology and the implementation of new programs into your practice, it’s important that we don’t forget the OG of healthcare technology advancement. Medical scribes have been around for years, and they’re often a vital component of any successful practice. However, many believe that with growing implementation of EHRs (Electronic Health Records) will make medical scribes obsolete. Others argue that no program will be able to replace the compassion, understanding, and intuition that a medical scribe can provide. Below we’ll take a look at the pros and cons of medical scribes. Before we can tackle the good and the bad of a medical scribe, we first need to define what exactly his or her role will be. As they are tasked with recording all of the information that a medical provider receives during a patient encounter. In a sense, a medical scribe is like a personal assistant for a medical provider. They will essentially take the information that has been provided via a medical form or verbally to a physician and record it so the entire medical staff can easily access and digest this information. This can include things like medications, medical history, insurance information, and many other vital tidbits. Medical scribes will take the burden off of medical providers by taking on the responsibility of collecting and reporting the important medical information. This will allow the healthcare providers to devote all of his or her time to provide the proper medical attention they deserve. With a scribe handling the note-taking and charting, a patient can feel the comfort of having their provider’s full attention. Peace of Mind – Like mentioned previously, a medical scribe can take some of the stress off of both the healthcare provider as well as the patient. 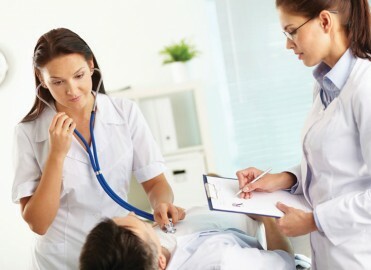 A medical professional can focus on what he or she does best, which is diagnosing and solving medical issues. Meanwhile, the medical scribe can record all the information that is necessary. This will allow the patients to relax, knowing that the physician will be able to provide 100 percent of their attention. Fewer People to Onboard – Another major benefit of a medical scribe is the number of people you have to implement. If you plan to implement an EHR, you’ll have to onboard almost your entire staff to ensure that the transition into the program runs smoothly. Instead, you’ll only have to train a medical scribe who will be able to decipher and communicate information that will be easy for your entire team to digest. When it comes to pros and cons of medical scribes, one of the most important things to consider is the face to face interaction they’ll have with your patients. Although the industry is moving rapidly towards telehealth, patients still want human interaction when they come to a medical facility. A medical scribe will be able to gauge the emotions of a patient, something a program cannot do. Streamlined Programs – It’s no secret that as technology grows, we’ll be finding ways to streamline certain careers or positions. This is why many facilities are implementing EHRs as replacements of medical scribes. When it comes to pros and cons of medical scribes, one of the biggest cons is that many believe that they can be replaced by a computer program. Instead of all the recording of information being put on one person, each person interacting with a patient can relay the information they find. That way all information will be collected and both providers and patients can access it. Fewer Mistakes – One of the biggest “negatives” when it comes to the pros and cons of medical scribes is simply that medical scribes are human. It’s no secret that humans make mistakes, and in the medical field, you want as few mistakes as possible. A medical scribe is one more person that has to relay the information, and things can often get lost in translation. Weary Patients – One final thing to consider when discussing the pros and cons of medical scribes is the reluctance of patients to divulge information to someone who isn’t their primary caregiver. They might often feel uncomfortable with a second person in the room as well. We’ve already discussed the pros and cons of medical scribes, and the arguments for and against EHRs. However, there’s also a third option. Many healthcare facilities are opting to instead keep their medical scribes while ALSO implementing HER programs. This will allow medical scribes to be in charge of onboarding to ensure that things run smoothly while still giving patients and medical professionals the easy access to all data. Where do you stand on this issue? Comment below!